Breaking Free – A short presentation (25 min.) to enable us to utilize and salvage the Post Yom Kippur period. 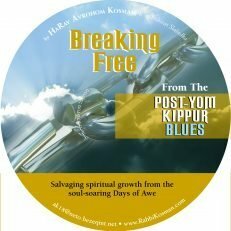 This period has often been described as a “down”, as we cannot maintain the lofty levels and feelings of the Yomim Norayim. When we feel, we are back to our “old” selves, this can be a depressing period of time. Breaking Free is an attempt to give us the tools to lock in and lock on to a level of spiritual growth.